The most unique restaurant near Woodstock, VT! We are very excited to offer on-farm dining–sumptuous meals in a relaxed atmosphere–on Fridays and Saturdays here at Cloudland Farm. 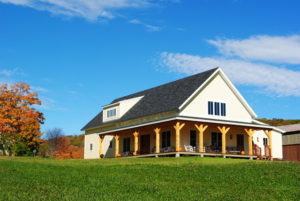 We have a post and beam building made from Eastern White Pine that was harvested from the farm. If you love eating locally-raised, healthy foods, we have a unique dining experience to share with you. Whether sitting on the porch before your meal or dining near the fireplace, your visit will be filled with the views and peaceful sounds of the farm where the delicious food you enjoy was raised. Chef Ira White prepares dishes made from ingredients that are grown right here at Cloudland and from other local organic farms. Absolutely everything we serve is made from scratch! The evening’s meal is selected by the chef using seasonal ingredients and will include beef, pork, chicken or turkey grown at Cloudland. If a member of your party requires a vegetarian entree or has other dietary restrictions, please mention that when making your reservation. All meals are fixed price, and Chef’s menu selection for each dinner will be posted here by Wednesday morning of each week. BYOB if you’d like wine or beer before or during your meal. We charge a small corkage fee of $5 – 10 per table (depending on the number in your party) and provide glassware and corkscrews. If you are looking for a place to purchase wine for your dinner at Cloudland, each week Eric Wegner, wine purveyor at F.H. Gillingham and Sons General Store on Elm St. in Woodstock selects the perfect wines to complement the Cloudland menu. Wine pairing suggestions are posted on the desk inside the store and you can ask for Eric if you’d like further assistance. If you prefer beer or cider, visit Woodstock Hops N’ Barley. Mack & Caroline O’Connell post our menus in their store each week and offer beer and/or cider pairing suggestions for each course of our menu. Cans, bottles, or growlers, they have a great selection to suit your taste. 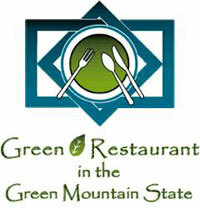 Reservations are required and can be made by calling us at (802) 457-2599. A 2-3 course plated farm supper that includes an optional appetizer course, an entree and dessert. Casual fare with local ingredients. A 3-course plated meal that includes appetizer, entree, and dessert. White linens & local ingredients. Children ages 10 and under are welcome to dine for 1/2 price.